Hello! 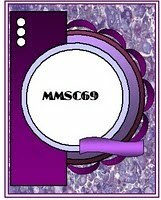 This birthday card was made for the MMSC 69 challenge at http://priscillastyles.blogspot.com/. This gorgeous hummingbird stamp was a Just Rite stamp colored with Copics, Prisma pencils and a spica pen. 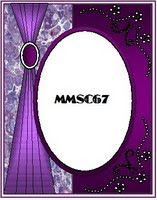 The DP I used was Basic Grey's "Wisteria". I also used a Cuttlebug corner die and half pearls that I colored with Copics. Thank you for visiting my blog and please feel free to leave a comment. Hello!! Welcome to my blog! I am very new to this so please bear with me! 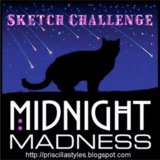 I made this card for the Midnight Madness Sketch Challenge at http://priscillastyles.blogspot.com/, and & Kids College Fund at http://7kidschallengeblog.blogspot.com/. The cute little Tilda image is from 7 Kids College Fund, colored with Copics and Prisma pencils. The DP I used is from my stash. I used MS punches, Prima roses and the leaves are ribbon. Thank you for looking and have a nice day!! Hi! This is very new to me. My daughter talked me into this and set me up a blog, so I am going to do my best to get this right. This is my first card ever posted. 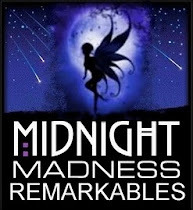 I made this card for the Midnight Madness Sketch Challenge at http://priscillastyles.blogspot.com/. I downloaded from Mo's Digital pencil this gorgeous bride and groom digi and the DP. I colored my image with Copics. I used Gina K and Bazzill cardstock. 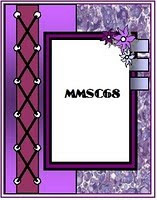 Also used was May Arts ribbon, pearl flourishes, ribbon slide, half pearls, and Stickles. Thank you for visiting and please feel free to leave me a comment!